Black Oak LED’s powerful turret-mounted LED light pods are the most durable, versatile and powerful LED pods on the market today. Four of the most advanced, brightest, energy-efficient, top-of-the-line LEDs are arranged in a 2×2 array within each compact, sturdy unit. Order one of three power levels to suit your application, whether it be lighting up muddy or dusty trails, high visibility for your dune-cruising ATV, awesome UTV or a swivel-mounted work light on your truck, tractor or heavy equipment. Select from 3W and 5W Osram LEDs or gloom-smashing 10W CREE XM-L2 LEDs. These pods stand up to the harshest environmental conditions with an IP69K intrusion rating against dust and moisture. That means they withstand 16 liters per minute of hot water with a pressure between 1160-1450 PSI. Try that on a cheap knock-off LED light pod. 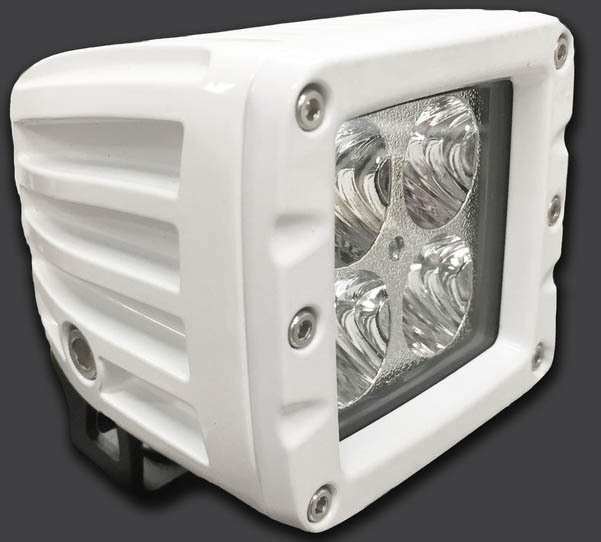 The solid aluminum housing not only provides utmost environmental protection but performs as an oversize heat sink for cool-running LEDs that easily achieve their rated 50,000-hour lifespan. Besides LED power choices, there are four optics options. Pod spot optics produce a narrow, piercing beam, whereas flood optics illuminate a wide forward swath. The diffuse option is ideal for interior applications and improving vehicle or watercraft visibility. Order Black Oak LED light pods with amber LEDs for foggy, misty or dusty conditions. The included mount has 100 degrees of rotation so you can place the beam right where you need it. Each unit comes with an IP69K-rated, complete wiring harness. It is ready for installation straight out of the box. Buy these best-in-class LED light pods without worry as Black Oak backs up their performance with a 30-day cash-back guarantee and lifetime warranty. 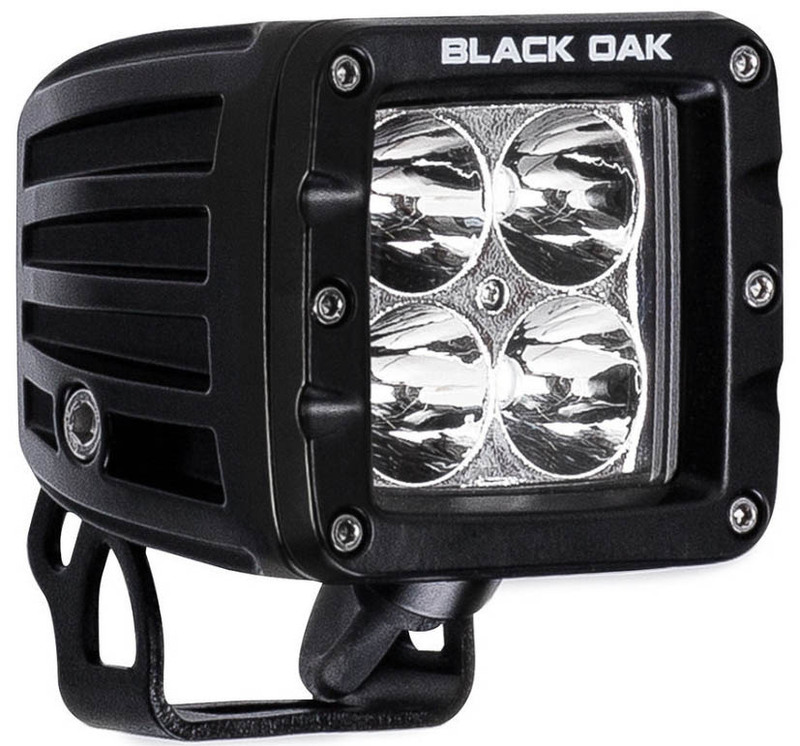 Black Oak 4-LED light pods measure just 3.25 b 3.25 inches, but put out an amazing amount of illumination, especially when equipped with 10W CREE XM-L2 LEDs. The applications that buyers of these think up are endless. One buyer runs them directly from their home’s solar system’s batteries to illuminate an outdoor grilling area. Another mounts them on tripods for lighting up work areas. Most buyers mount them on vehicles as either fog lights, spotting lights or super-bright high beams. Whatever you use them for, have no worries that these perform admirably and will continue to do so for many years. Black Oak’s compact, turret-mount LED light pods are the brightest thing next to daylight and built just as ruggedly as their full-size light bars. They are a steal at under $70 considering the level of performance. Nothing that even high-end competitors offer can match their superb value. You can read more detailed review here. Black Oak LED’s marine-grade 2×2 LED light pod comes with a rotatable turret mount ideal for placing a spot beam exactly where needed. These are tough, dependable lights that can withstand saltwater environments thanks to special coatings and an IP69K marine rating against dust and moisture. They can be completely submerged in up to 3 meters of water. For lake, ocean or river navigation, these powerful 4-LED pods are excellent for lighting up docks and making sure other watercraft see you. The diffuse optics option is useful for lighting cabins and decks. Select from three light levels by specifying 3W or 5W Osram LEDs or crazy-bright 10W CREE XM-L2 LEDs. All are rated for 50,000-hour lifespans supported by tightly specified driver circuitry and an oversize heat sink built into the tough aluminum housing. Choose one of four optics configurations to suit your application: Spot, Flood, Diffuse or Amber for foggy or misty conditions. Every pod already comes with a waterproof wiring harness, mounting hardware and Black Oak’s lifetime warranty and 30-day full-refund satisfaction guarantee. These outstanding marine-grade, LED light pods fit any size craft to suit any use you can imagine. Night fisherman love them for lighting up river banks and bay shores when navigating narrow waterways. Because they have a wide input voltage range, they run from 12V or 24V power systems without modification. If you want extreme reach into the darkest inlets or streams, equip them with the 10W CREE XM-L2 LEDs and the spot option. Nothing can hide from that murk-crumbling combination. About the only minor complaint one reads about these pods is that the turret does not turn 360 degrees, but no one is complaining about the durability and brightness of these exceptional lights. There is simply no better 2×2 LED light pod on the market than Black Oak’s compact, turret-mount marine-grade LED pods. With 10W CREE LEDs installed, nothing can touch them for brightness or long-lasting, top-rated luminance. Even if you do not own a boat, you might want to order these to match your white vehicle. Remember, military, police or fire personnel always get 15 percent off any Black Oak products. You can read more detailed review here.